The interior decorating and design of the Trump International Tower in Vancouver, British Columbia is modern and elegant, making it one of BC’s greatest hotel venues to host a wedding. From the stunning lobbies and hallways, to the fine detail of the furnishings and décor, the high-end location gives a classy and luxurious atmosphere for any large event. The 5-star hotel offers many quality necessities for a bride and groom to choose from. Each staying area in the building is bright and airy, with many facilities to offer, making it the ideal place for newlyweds and their guests to stay. Rooms of the tower are also offered for the bride and groom to get ready before the ceremony. As wedding photographers, we love entering an area that has limitless opportunities for detail shots and portraits of our clients. Since hotel weddings are often indoors, we must get these photos using what we are given in the facility. 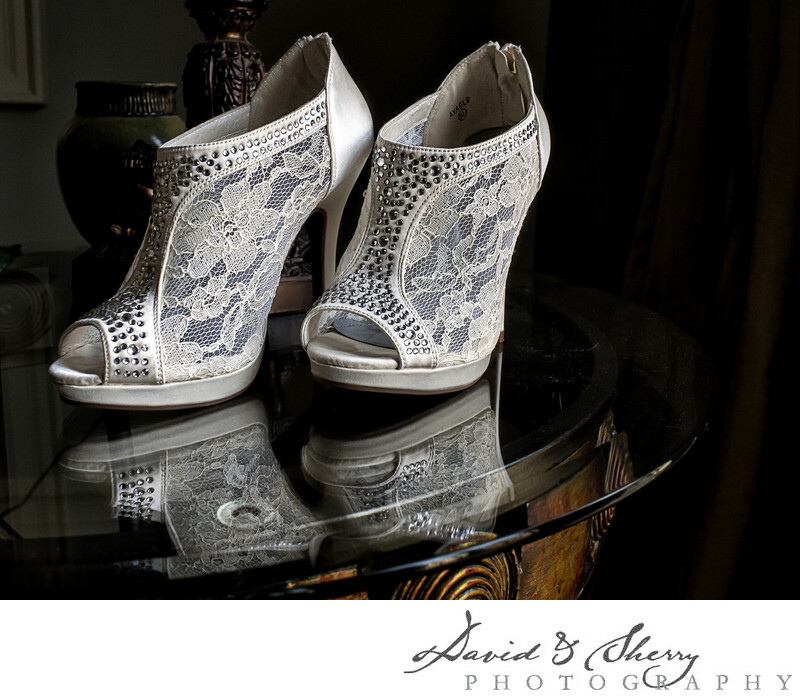 This pair of designer, lace high heels that the bride wore did not need to be complicated. I wanted this shot to focus on the detail of the floral lace and the rhinestones. Placing them on a glass bedside table and creating a reflection effect was all that was needed to make this a fashionable and stylish detail shot. Location: 1161 W Georgia St, Vancouver, BC V6E 0C6.